SSERVI is partnering with the Journey through the Universe team for an annual two-week program. The SSERVI’s involvement in classrooms, public venues, and teacher professional development extends into the communities throughout the country with the help of the “Journey through the Universe” program. Journey through the Universe is a national science education initiative that engages entire communities—students, teachers, families, and the public—using education in the Earth and space sciences and space exploration to inspire and educate. Journey through the Universe is a program of the National Center for Earth and Space Science Education, which facilitates Journey events in ten communities across the country. One of the Journey instantiations is conducted by the Gemini Observatory. Gemini’s Journey program, now in its seventh year, serves the community in and around Hilo, Hawaii. Key partners in Gemini’s Journey program include the various observatories operating on Mauna Kea, the Hawaii State Department of Education, the University of Hawaii, the Imiloa Astronomy Center, and SSERVI. Raises awareness of science in classrooms. Helps students meet the Hawaiian Content and Performance Standards and national standards. Taps into the Hilo community’s resources. Improves teaching staff in content fields. Educates parents and the community in the space science enterprise. This Journey program typically runs in February-March and it features a Family Science Day public event at Imiloa Astronomy Center, Family Science Night at the University of Hawaii Hilo, an astronomer workshop, a teacher workshop, and a master teacher training session. Through audience participation, the family science events provide a family learning experience in exciting human space flight, with Earth and space science subjects that are connected to the curriculum. K-12 Education Modules training is provided during the educator workshops. These Modules include content overviews; inquiry-based, hands-on activities; assessment rubrics and resource listings. The heart of the program is a full week in which 48 astronomy educators (lunar scientists, astronomers and observatory engineers) are sent into classrooms to explain to over 8,000 K-12 students how they are working to exploring the universe. Classroom visits by these astronomy educators are designed to provide students with standards-based science content, allow students to personally interact with scientists and engineers, and inspire students to further their education in the areas of science, technology, engineering and mathematics. SSERVI’s participation in Hawaii’s Journey through the Universe program provides students and the public with a new understanding of recent, current, and future NASA exploration. It also introduces them lunar-related educational resources available to classrooms and families. 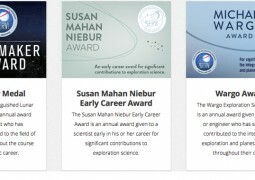 The SSERVI team leverages the Journey experience to engage the Pacific International Space Center for Exploration Systems, the Imiloa Astronomy Center, and Astronaut Ellison S. Onizuka Space Center with SSERVI communication programs including International Observe the Moon Night and Exploration Uplink. It also provides an opportunity to recruit University of Hawaii students and local amateur astronomers to join NASA’s Lunar Meteoroid Impact Observation Program. For more information on Gemini Observatory’s Journey through the Universe program, visit http://gemini.edu/journey. InOMN is an annual public outreach event that provides opportunities for new partners to engage the public in lunar science and exploration. The goal is to converge the exploration science and education community, our partner networks, amateur astronomers, space enthusiasts, and the general public in an annual lunar observation campaign to share the excitement of lunar science and exploration. InOMN events use the “Tweet-up” model and partners’ dissemination networks to promote and recruit participation in the events. All information about InOMN is supplied on a central website, accessible to the public. Members of the public are encouraged to host their own InOMN events, and local astronomy clubs, schools, or other groups can post information about InOMN events they are organizing. To assist with their efforts, the website contains downloadable documents of advertising flier templates, Moon maps, and activities that are distributed at the national events, such as Moon calendar journals. After the events, participants are able to continue using the website to follow links for more information about sites indicated on their Moon maps. The InOMN Team consists of scientists, educators, and Moon enthusiasts from government, non-profit organizations, and businesses throughout the United States and across the globe. We believe in the inspirational power of the Moon— a celestial body that has influenced human lives since the dawn of time. InOMN has created the opportunity for people to take notice of the Moon’s beauty and share that experience with one another. 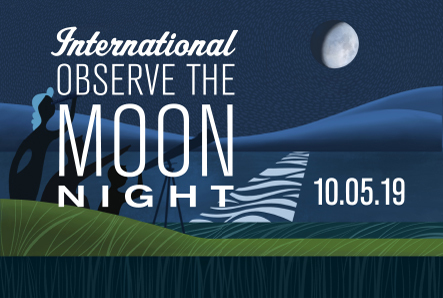 Through InOMN, we hope to instill in the public a sense of wonderment and curiosity about our Moon. Our partnerships enable us to stay up to date with the latest and greatest scientific discoveries about Earth’s nearest neighbor, and bring those discoveries to the public. SSERVI is rich with scientists, engineers, and communication professionals that represent a large network of speakers happy to share the latest discoveries with local, state, and national audiences at various community event and civic group venues.